Good and bad can be a matter of degree, something that can be adjusted like the volume dial on a radio. If power is relative then that it means different things to different people, and its abuse becomes a matter of degree. Freedom should be equal for all humns but history demonstrates otherwise. Yet there is one ruler whose mercy, justice, freedom, and love make us equal in his heavenly realm. That one is Christ the King and may we praise him now. The central conflict in the Bible is the tension between God and man, good and evil, heaven and earth. On the Solemnity of Christ the King. We affirm our belief that there is a higher realm than what we see before our eyes. And we affirm that Christ is the ruler of that realm and we as subjects must devote ourselves to him and to him alone. The reading that I think describes these things best is the Book of Revelation. This is a very difficult and misunderstood book, the very last one in the Bible. But it’s a great story, once you get past the boiling seas, the living dead, and the diabolical beast. Revelation is not so much about the end of the world as it is about the beginning of eternity. The door between heaven and earth has been opened and we are invited to become citizens of heaven under the rule of Christ the King. His victory over sin and death has won for each of us our place in heaven. The king doesn’t force us to worship. We can choose whether to live as citizens of Christ’s kingdom of heaven or remain grounded in the limited space and time of planet earth. What the Catholic endures today in the world is the same as it was in John’s day. The relationship between Church and state, God and government, and life and death remains tense. We live in a land where the presence of God is not welcome as it was before. The attacks against faith by some atheists have become a severe problem for believers in America. They claim that Catholics should keep their faith to themselves and hide in our churches, that we have no right to try to influence our society. The U.S. was not founded to be a theocracy, they say. To be fair we are a pluralistic society and many thoughts, beliefs, and ways of life are welcome between our borders. Despised perhaps, but tolerated. The truth that holds us together, bestowed on us by the power of God, allows us to remain confident and strong in our faith even in the face of those who would destroy what we hold to be sacred. The power they desire — even if they were to gain complete control of the country — is the very thing that will take them down. Both history and the Scriptures testify that this is true. Revelation is a cosmic story about the eternal struggle between order and chaos, a story that is as old as humanity. Ancient writers believed that God was the Savior of the world because through his power and love he created order out of chaos. This chaos exists within us and without; chaos, disorder within, is what drives people to be corrupted by too much power, for from the darkness of the heart the mouth speaks and our actions will ultimately confirm the words we speak. 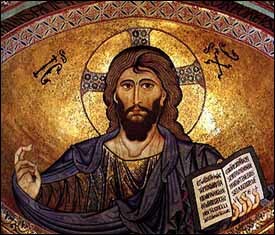 Christ the King is the ruler for all time and space, the Truth that cannot be relativized because he is the Ancient One. His benevolence cannot be measured or gerrymandered. He is the Alpha and the Omega, the First and the Last, the One who is and the One who is to come. Uncorruptible. The gates of the kingdom are open wide for those who believe.